Morgan Schneiderlin says the return of former Southampton manager Mauricio Pochettino with new club Tottenham on Saturday will not affect the players. Pochettino returns to St Mary's for the first time since his acrimonious departure to Spurs last summer. But ahead of the vital Premier League clash, France midfielder Schneiderlin says Saints have moved on. "He's a great manager, we achieved great things last year but the page is turned," he told BBC Radio Solent. The former Espanyol boss took over at Southampton in January 2013, when he replaced Nigel Adkins, and led them to eighth last season - their highest finish in the Premier League. After stalling on a new contract, he was appointed Tottenham manager on a five-year deal in May 2014. Schneiderlin was also linked with a move to White Hart Lane but the club refused to sanction the sale. 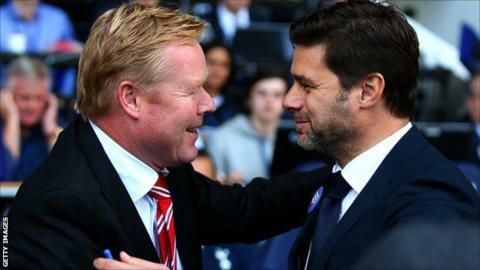 Southampton fans are planning a 'Ronald Koeman Day' on Saturday and intend to wear orange in support of the former Dutch international, who replaced Pochettino as Saints manager. Sixth-placed Tottenham are a point ahead of Southampton in the battle to secure European football for next season and Schneiderlin says Saints are ready to bounce back from Saturday's 2-1 defeat by Stoke. "The view of the [Tottenham] match is that it is not going to define our season, because if you lose the game but win the next four, it means nothing," he said. "It is going be a very important month and I think everyone is looking forward to this game for many reasons. We are ready to show we deserve sixth or fifth and we want to make a statement. "